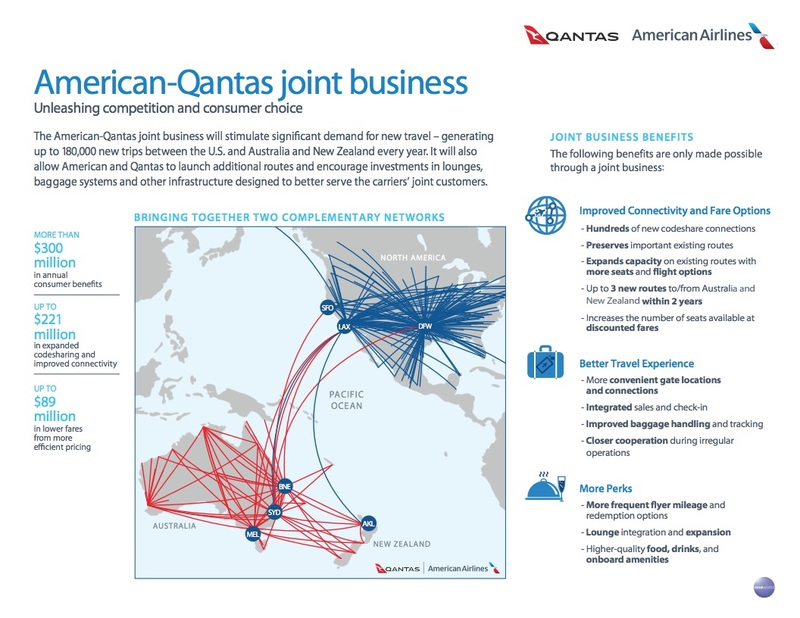 Newsroom - American and Qantas File Application to Form Joint Business - American Airlines Group, Inc.
American and Qantas look forward to working together to deliver new routes, a more seamless travel experience and greater access to lower fares under a joint business. Qantas is Australia’s largest domestic and international airline connecting Australians to the world. It is widely regarded as one of the world's most respected full-service airlines and one of the strongest brands in Australia, with an outstanding reputation for excellence in safety, customer service, operational efficiency and technical innovation. The Qantas network spans 46 countries across Australia, Asia and the Pacific, the Americas, Europe and Africa and almost flies to 60 destinations throughout Australia. The U.S. is one of Qantas’ most popular destinations routes, with its first Trans-Pacific flight taking place in 1954 to San Francisco. Qantas offers more non-stop flights per week between the U.S. and Australia than any other airline with direct flights from Honolulu, Los Angeles, San Francisco, New York, Dallas/Fort Worth, Honolulu and Vancouver, and more than 120 codeshare city pairs across the U.S., Canada and Mexico from Qantas gateways.